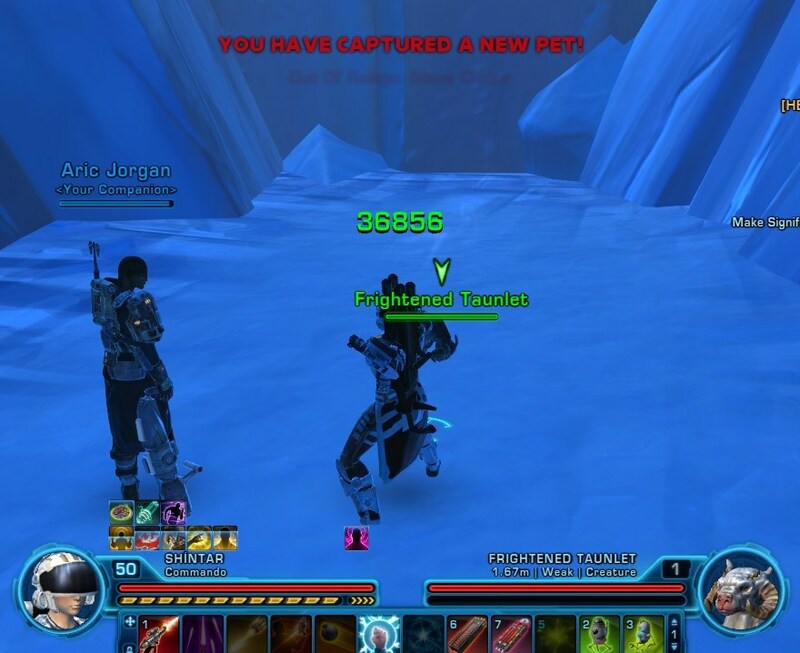 When patch 1.2 introduced two new vanity pets, I didn't really care much. 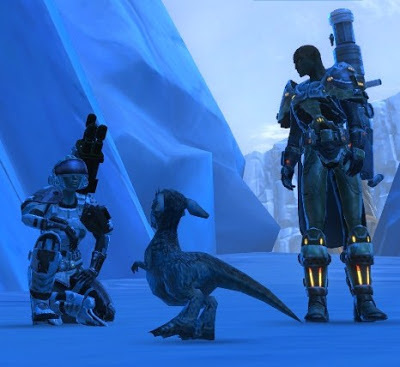 I mean, I saw them around the fleet and thought that it was neat that Bioware added them, but I've gone on record for saying that with things like that, less can be more, and I'm not much of a pet collector anyway. The thing that did intrigue me a little however was the fact that to get the taunlet pet, you needed a food item created by biochem (!?) called Ice Scrabbler Jerky. I kept finding Ice Scrabbler Liver (one of the rare ingredients) out in the world and wanted to use it, but the recipe was a drop from various world bosses, and I didn't realise that it was BoE, so it seemed kind of out of my reach. I more or less forgot about it whenever I wasn't picking up another liver somewhere... until the recipe dropped off one of the bosses in Explosive Conflict the other night. (Can't you just picture Colonel Vorgath playing part time chef during his free time?) It was graciously awarded to me as everyone else who might've been interested in it already had it. At last! I figured that now that I knew how to make that jerky, I should bloody well make some, especially since I had some livers saved up anyway. But what's that? More rare ingredients? Ice Fern that only grows in a select few locations on Hoth? Oh well, off I go then! "Shintar, what are you doing on Hoth? Are you still working on HK?" "No, I've barely even started on that one. I'm, erm... picking flowers..."
Of course people couldn't leave me to something as simple as that and next thing I knew I wasn't picking flowers anymore. I think I got sucked into running a couple of warzones or something; my memory is a bit hazy on that. Still, I managed to pick up a couple of ferns before getting distracted and sent Elara off to make me some jerky. (There is a bad joke in there somewhere.) Okay, now that I had some jerky, I might as well eat it? And get that pet I guess? Might as well! Today I had a day off from work and logged on in the early afternoon. The guild was fairly quiet with only two or three other people on, and they seemed to be busy doing their own things. Excellent, a chance to complete my jerky quest in peace! Of course, I had barely been on Hoth for five minutes when I realised that I was still missing the pet capturing item from Alderaan as well. D'oh. Since going back and forth between planets is a bit of a pain, I decided to stay for now anyway and started collecting datacrons, even if they didn't have any useful stats for me. Guildie: Hi there! Anyone for some warzones or dailies? I immediately felt the itch to group up, but wanted to stick with my plans for once. I decide not to say anything and let one of the others reply, but nobody says anything at all. After a while, the guildie rephrases his request and asks again. I'm starting to have mental images of the poor lad staring at his screen and being heartbroken that all his guildies are total jerks and ignoring him. Me: Not right now, I want to complete my stuff on Hoth. Guildie goes on to pvp on his own, occasionally providing running commentary about how fun it is. Meanwhile, I try to get the cunning datacron on Hoth and find all kinds of new ways to fail at jumping, even though I've successfully picked it up before on other characters. (Did I seriously just back off the box while trying to prepare for a running jump? Good god.) When I finally make it on the umpteenth attempt, I feel mentally exhausted. Why am I doing this again? I pause for a moment to give a random knight a free ride to the top (cheeky force leapers) and then surrender. Me: I give up. Let's go do some dailies, your choice of location. It was late in the evening by the time I once again made it back to Hoth, after operations and warzones were both done for the day. Everyone but one guildie who was levelling an alt was gone, and he was just having a laugh at me for still struggling with the same old thing. Then I realised that I had forgot to buy the pet capturing device again. This time I went back for it though. And then, after returning to Hoth for the umpteenth time in days, and after I had also collected all the datacrons there: victory! I'm not sure the RSCPA would approve of me frightening critters with grapple guns. tl;dr version: There are some neat little things in the game that randomly connect different locations and crew skills. They are quite fun if you ever find the time to do them. I learned how to make jerky and captured a miniature tauntaun. Also, I seem to have a talent for getting distracted way too easily and turning even the more mundane parts of the game into journeys of epic proportions.